The Vitra EA 117, and the other Aluminium Chairs designed by Charles and Ray Eames in the 1950s continued the pairs research with the design principle of the one-piece seat shell. 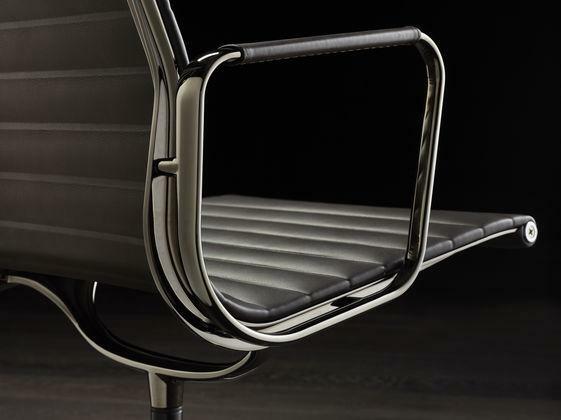 In particular they created a chair in which a textile or leather cover is stretched between two aluminium side panels and thus the upholstery serves as the seat and the backrest. Whether in the home office or as an office swivel chair, the EA 117 with its ergonomically formed backrest and luxurious combination of leather and metal meets all the necessary requirements of a quality work environment. Variants In the leather version, the back cover is colour-matched in the fabric Plano (100% polyester). 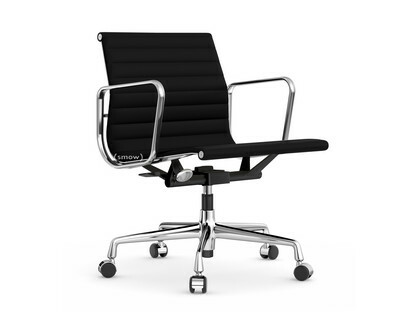 How much weight can an Eames EA 117 support? 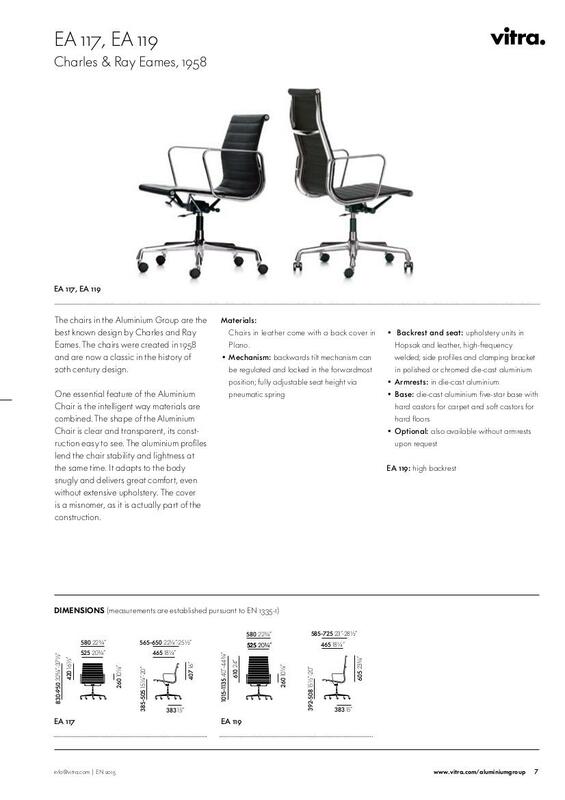 The chairs are tested to 110 kg. If the user is heavier, the wear and tear on the chair increases. However not only the user's weight plays an important role in the wear on the chair, the sitting habits and the way in which the user sits into and stands up from the chair are also important. Certain actions such as, for example, leaning heavily in the armrest when standing up can lead to high localized stress concentrations which may be greater than the burden of a "static seated" very heavy user. With the Aluminium Chair and Soft Pad groups only the complete seat can be replaced, re-covering is not possible. Such a replacement must be undertaken by Vitra trained technicians. Does the EA 117 come with a warranty from the manufacturer? Vitra offers a warranty of 30 years on all parts of the Aluminium Chair and Soft Pad models not normally liable to mechanical wear. In 1957 Charles and Ray Eames developed a new series of chairs and armchairs, the so-called Aluminium Group. 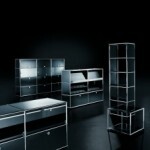 Over the decades the Aluminium Group has evolved to become a genuine classic of modern furniture design. Including the Vitra EA 117 Aluminium Chair Originally developed in context of a private residence in Columbus, Indiana, being built by Eero Saarinen and Alexander Girard the Aluminium Group marks a significant change in the oeuvre of Charles and Ray Eames; for the first time the two designers ignored the principle of the seat shell, a design form that the pair had successfully developed with their Eames Plastic Chairs in the 1950s and reused in further designs. For the seat and backrest of the EA 117 Charles and Ray Eames used for the first time a sheet of textile or leather stretched between two aluminium side panels and thus carries the load. The silhouette of the side panels is modelled on the human spine and thus the chair reflects and supports individual body shapes: In the Vitra Eames EA 117 one sits safe, secure and upright. The design of the EA 117 is characterized by the ergonomic backrest and the delicate line of the armrests, while the cast aluminium foot provides a stable base. With this intelligent combination of materials of the Eames Aluminium Chairs embody dynamics and flexibility, while also suggesting control and status. 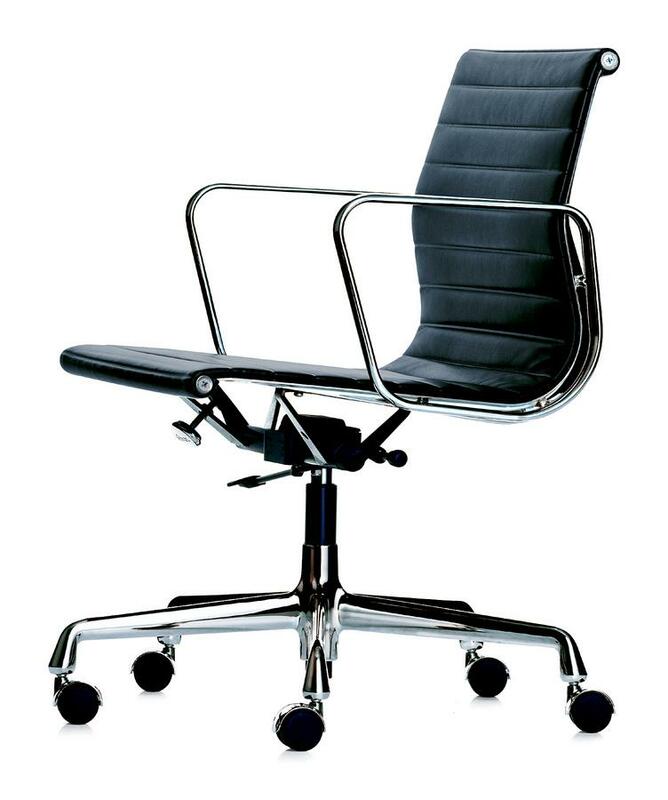 The Vitra EA 117 - as well as the other chairs in the Eames Aluminium Group - have been produced since the 1950s by Vitra in an unchanging and consistently high quality. Following the tradition of Ray and Charles Eames, a central component of Vitra's philosophy is to guarantee the durability of all their the products. Something helped by the fact that over the decades the aesthetic of the Eames designs has lost none of its contemporary charm. Such configurations of history and culture mean that Vitra can offer a thirty year guarantee on all products from the Eames Aluminium Group: simply put they know they will last and know that they have been built to last. The Vitra Eames Aluminium Chair 117 is manufactured with side profiles, clamps, arms and feet in either polished or chromed die-cast aluminium. 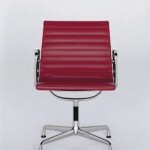 The covers of the Eames EA 117 are available in either leather or fabric upholstery. 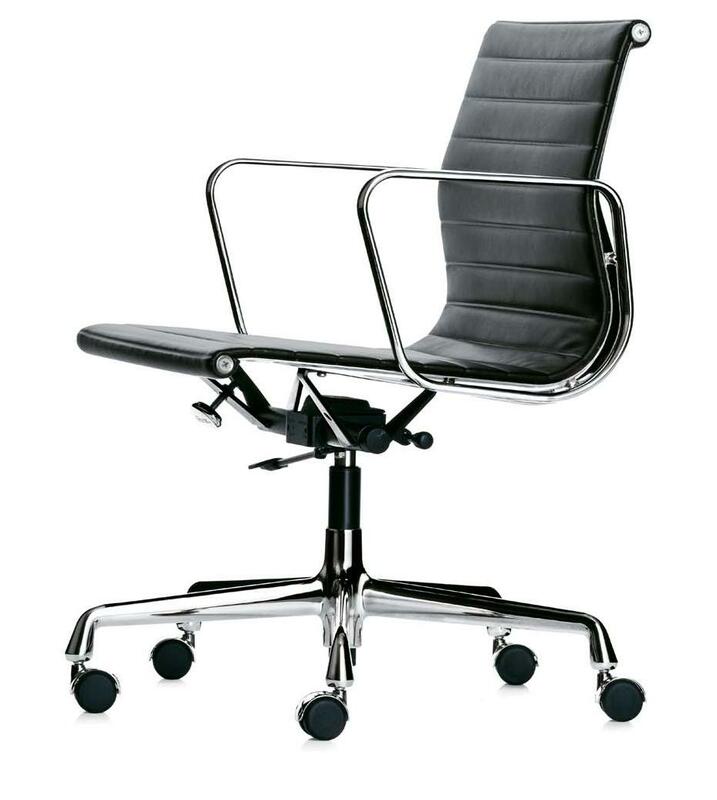 The Vitra EA 117 is an office chair with medium height backrest. 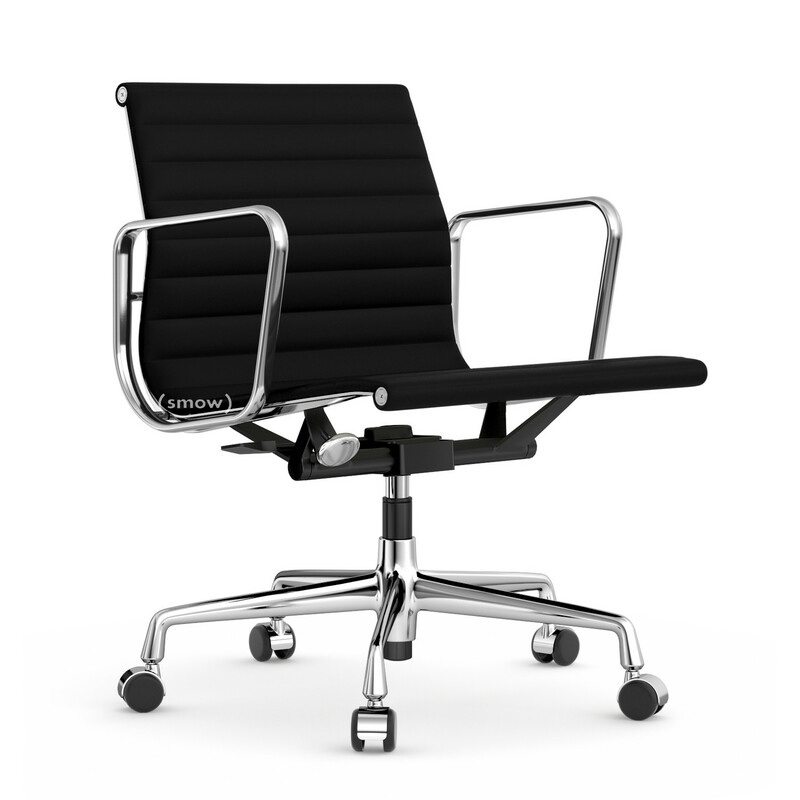 As the EA 119 the chair is alternatively offered with high backrest. The designer couple Charles and Ray Eames are best known today for their pioneering furniture designs. Designs which emerged alongside their architectural works, films, graphic works and numerous designs for toys and textiles and which made them one of the best known and most successful design studios of their generation. Born in St. Louis, Missouri in 1917 Charles Eames studied architecture at Washington University, opening his first architectural office in 1930 before in 1938 taking up a lectureship in design at the Cranbrook Academy of Art. 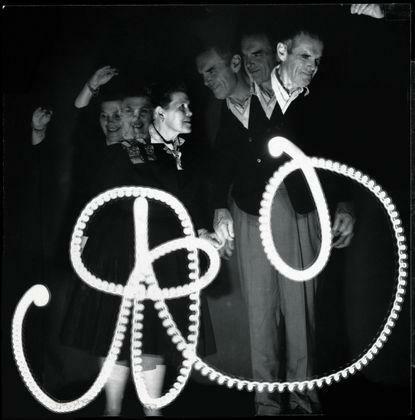 During the preparations for the "Organic Design in Home Furnishings" competition at the Museum of Modern Art in New York in 1940, Charles met Ray Kaiser. Five years younger than Charles Ray had previously completed her painting studies with Hans Hofmann in New York. These two differing backgrounds were, in may ways to provide the bedrock of Charles and Ray Eames future success. In 1943, two years after their marriage, the pair founded the now legendary Eames Studio in Venice, Los Angeles. Until the closure of the studio, following Charles Eames' death in 1978, it was responsible for a wide variety of different furniture styles and accessories. 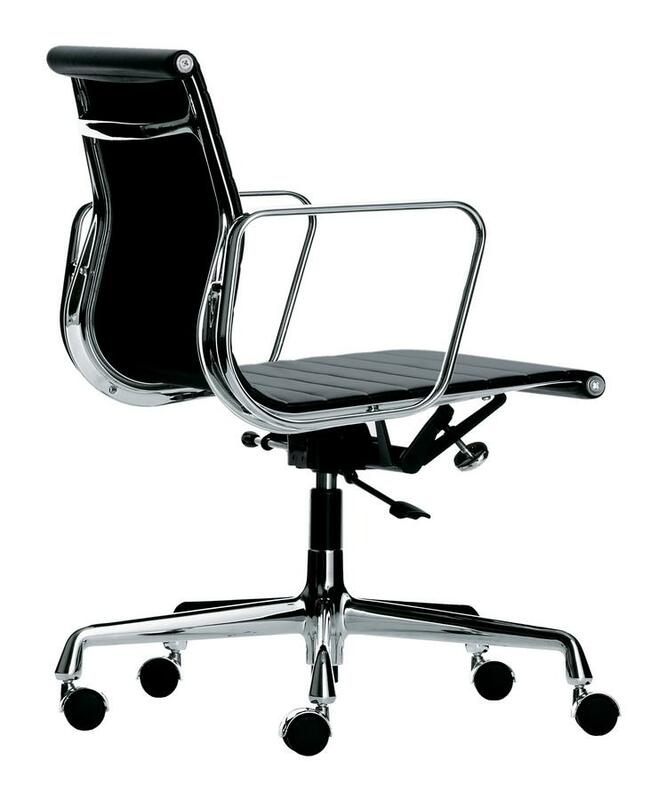 Charles and Ray Eames devised the EA chairs as the Aluminium Group family. During the tense post-war years the United States was witness to complex, far reaching social upheavals. Upheavals which saw social values shifted or completely redefined. These changes were accompanied by rapid advances in science and the emergence of pop culture and consumption and which demanded functional and factual forms based on the utilisation of new technologies and manufacturing capabilities. Against this background the Eames based the design of their EA 117 on the functionality of the construction, coupled this to the properties of the materials and adapted the complete composition to industrial production. Aluminium is and was easy to mould and has the advantage of possessing a high load-bearing capacity. The construction of Aluminium Chairs could be slightly adjusted to allow the chair to be used in various fields. As such the design of the Aluminium Group stood for a new flexibility and easily integrated into different areas of everyday life. The production of Eames designs by Vitrahas a long history, dating as it does back to the fifties, It is also a history marked by close cooperation between the company and Ray and Charles Eames. The first time Vitra founder Willi and Erika Fehlbaum saw an Eames chair was in 1953 in a New York shop window. 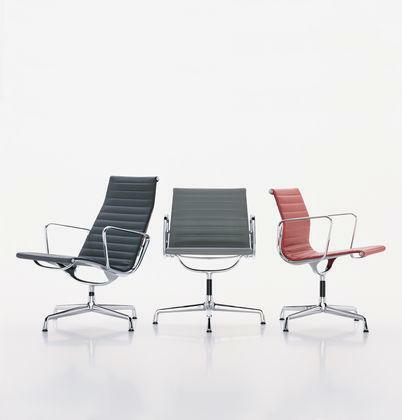 Several years and several negotiations later the pair acquired acquired the two production licenses from Herman Miller, who was responsible for the production of Eames designs in the United States. Since then, Vitra have been the only licensed manufacturer of Eames designs outside the United States. As an expression of the close relationship between the Eames and the Fehlbaums the estate of Charles and Ray Eames passed into the hands of the Vitra following Ray's death in 1988. In addition, essential characteristics of the Eames philosophy are deeply incorporated in Vitra's principles and most decisions in the Vitra product development process are still taking as if Charles and Ray Eames were involved. 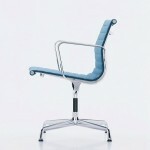 The Vitra EA 117 belongs, as with the other Eames seating and tables objects, to the the most successful Vitra products. In addition however to the Eames designs Vitra also produce works by a variety designers, including, Isamu Noguchi, Hella Jongerius, Verner Panton and George Nelson. 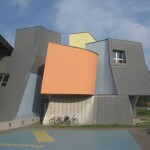 Meanwhile with the Vitra Campus in Weil am Rhein Vitra also possess a unique collection of architectural works including the VitraHaus and the Vitra Design Museum with its exhibitions on design, art and contemporary culture.